Blog post: Silvia Faini, E3C European CDISC Coordinating Committee member, reflects on the CDISC Europe Interchange conference. CROS NT was an exhibitor at the event as a CDISC Gold Member. 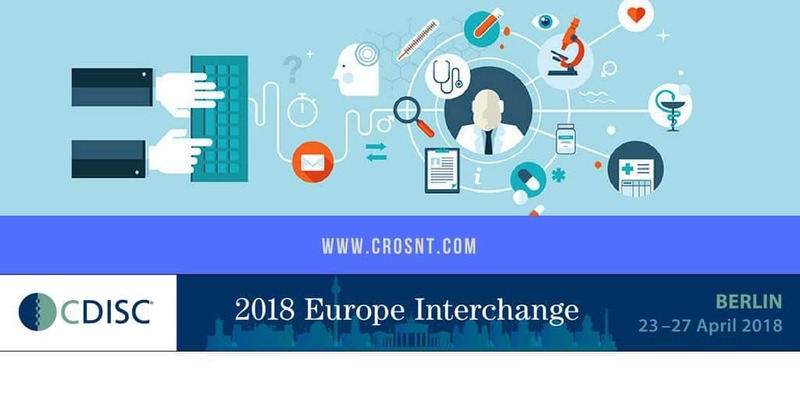 Organizing the annual European CDISC Interchange is among the duties of the European CDISC Coordinating Committee (E3C). As an E3C member, I enjoyed and experienced the conference as both a participant and an organizer. In this short article you can find some key takeaway points from some of the sessions. After the opening plenary session, the usual regulatory session took place. FDA representative, Dr. Fitzmartin, presented the new version of the Data Standards Catalog and the Technical Specification Guidances available for HIV and Vaccines. Dr. Lin explained the new validation process established at the end of 2017 mentioning the development of Study Data Standardization Plan Completion Guidelines (https://www.phuse.eu/css-deliverables) by a PhUSE working group. Dr. Ando, from PMDA, gave feedback on the most frequent issues in eSubmission and underlined that Analysis Results Metadata (ARM) is recommended. Dr. Cave of the EMA presented the challenges of submitting a marketing authorization and how to speed up the process. She pointed out that even if a Common Data Model is one of the “enablers” of a quicker process, the EMA still does not require CDISC standards. The next session topic was Global Submission Experience, and it was interesting to listen to some case studies from pharma companies. Basically today, CDISC submission packages must be prepared separately for the FDA and PMDA because the requirements differ between regulatory agencies. The benefit of using CDISC standards was not under discussion, but handling a global submission needs a good plan for all aspects including: submission deliverables, regulatory agencies’ recommendations, meetings with the authorities. A global submission is challenging, but feasible. In the last part of the first day I had the chance to present in two sessions. During ADaM session, I co-presented “The unveiled secrets of ADaM” with Angelo Tinazzi (an E3C colleague) where ADaM practical use cases were presented and discussed with the audience: data imputation, use of analysis flags, making an ADaM dataset ‘analysis-ready’, examples of wrong interpretation of ADaM IG and ways of achieving good data-point traceability. My second commitment was in the Newcomers track, a new successful track introduced this year, where I did an introduction to ADaM for CDISC newbies. In the morning of the second day, during Process implementation and optimization session, I gave a presentation on “A Statistics-Based Tool to Inform Risk-Based Monitoring Approaches” highlighting CROS NT’s experience in centralised monitoring processes. Other noteworthy presentations included: “Cost Benefit Analysis of Using Standards” where the costs and benefits achieved with different levels of standardization were shown. It was a thought-provoking presentation that showed the significant impact in setting up a trial from no standardization to some level of standardization and that the time for setting up a trial from a high level of standardization to a fully standardized trial rapidly decreases. Once more, CDISC standards implementation is a highly recommended choice. In my final role during this information-rich conference, I chaired the DefineXML session. All three presentations were valuable: a real life experience in big pharma for define.xml version 2.0 creation and related processes, one about some good tips on the usage of Value Level Metadata (VLM) and the most technical “Define-XML – What You See Isn’t Always What You Get” about stylesheet modification/improvement. Before the final panel discussion, some other technical aspects in implementing CDISC standards were described in the session Challenges and doing better. Collection of Race and Ethnicity Data, Pharmacokinetic Parameters (PP) Domain, Standardized Units, Event Adjudication Results, Associated Person (AP) Domains were all discussed as “Top 5 Challenges for Complying with CDISC Standards”. The task of creating SDTM compliant databases was discussed also in presentation “SDTM: It is Not all Black and White”, where the discrepancies between SDTM/SDTM IG and Pinnacle 21 or FDA highlighted the issues to be handled at programming level. What solution was recommended? Agreeing a uniform approach during and between studies. In the last months, the collaboration between CDISC and other organizations, such as PhUSE, has increased, and several presentations provided good examples of how much PhUSE working groups are important helping CDISC standards implementation.